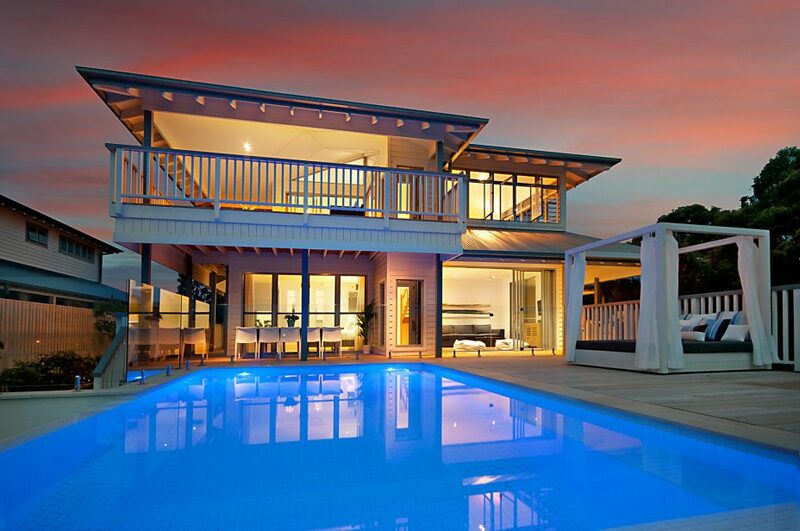 Luxurious Byron Bay Beach House with panoramic views. 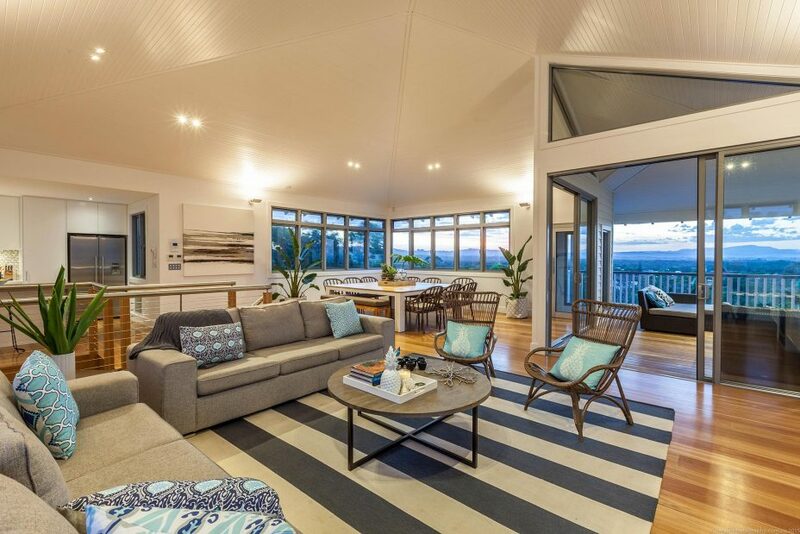 Vantage Over Byron is a luxurious beach house with panoramic views over the Hinterland, My Chincogan, the Pacific Ocean, Julian Rocks and the light house. 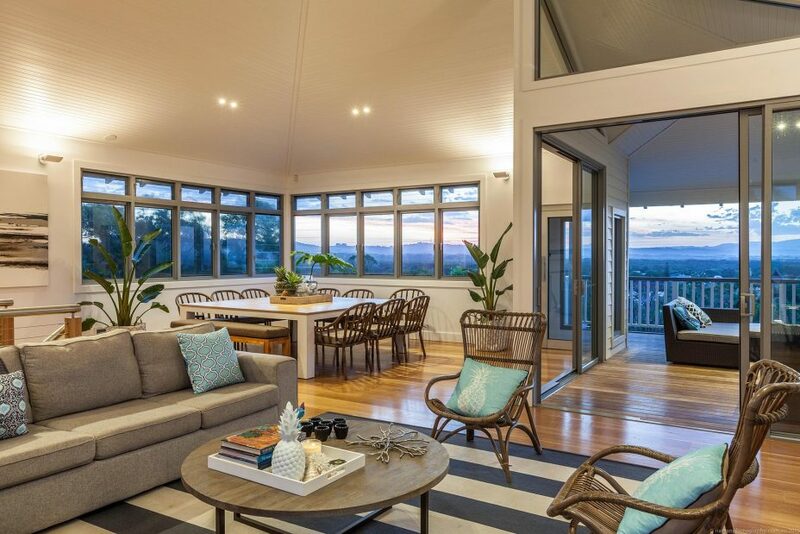 Vantage Over Byron is a modern, luxury, architecturally designed holiday home with 5 large bedrooms, 3 bathrooms and spectacular panoramic views of the the Pacific Ocean, Byron Bay town and the lush green Hinterland. 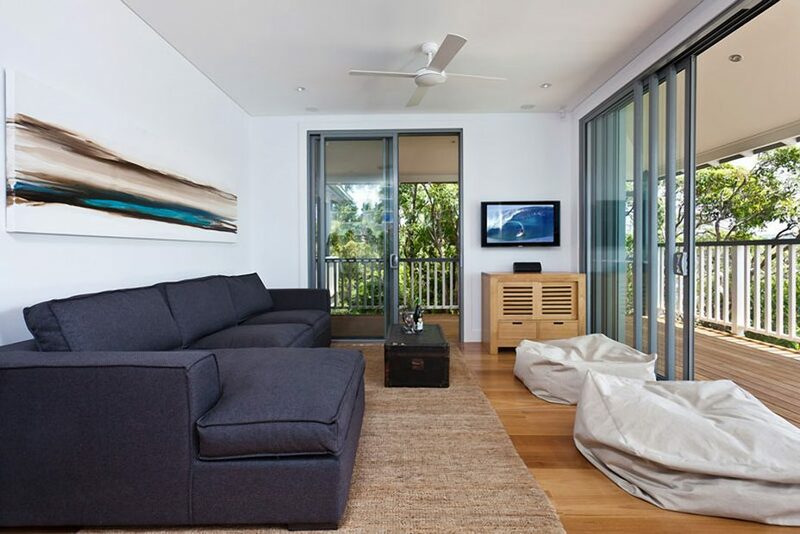 The home boasts simple yet stunning coastal styling and is rich with natural light, with wall to wall glass and seamless indoor-outdoor flow. 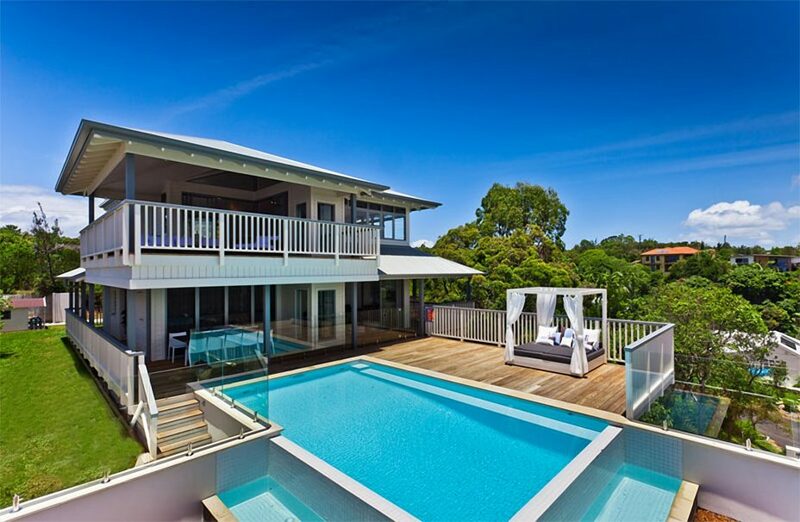 An entertainers delight, this pristine property includes a gourmet kitchen with high-end European appliances, an organic herb garden, a wet bar, BBQ and dual covered outdoor entertaining areas. 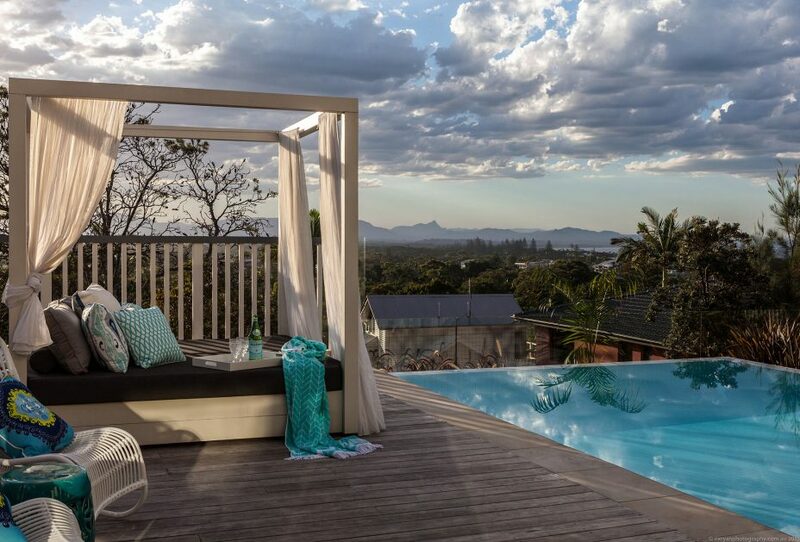 Snooze in the sun on the luxurious daybed and cool off in the infinity edge pool, overlooking the Hinterland. 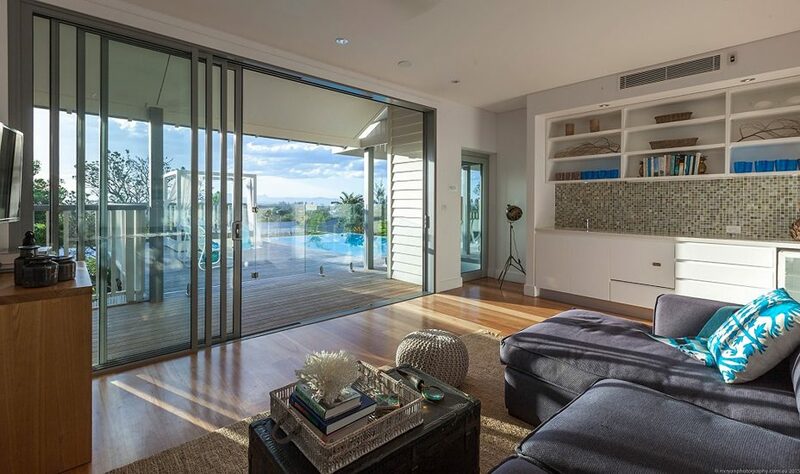 Vantage Over Byron offers disabled access, with a glass lift accessing all levels. 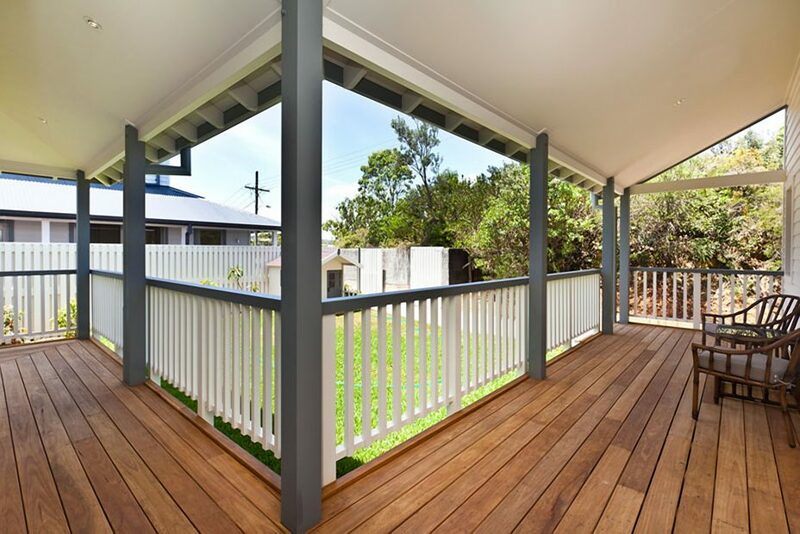 Located on one of Byron Bay’s most prestigious streets, from this prime central position, it’s less than 10 minutes walk to town, 7 minutes walk to the beach, a 2 minute stroll to the much loved local’s cafe, the Top Shop. Also in easy walking distance is the beautiful Arakwal National Park. Bathe in natural light in the dual living spaces at Vantage. The huge open plan dining and living space is encased in windows and includes a sun-drenched, 12 seater square dining table setting, modern, comfortable lounges, a gorgeous gas fireplace and flat screen TV. 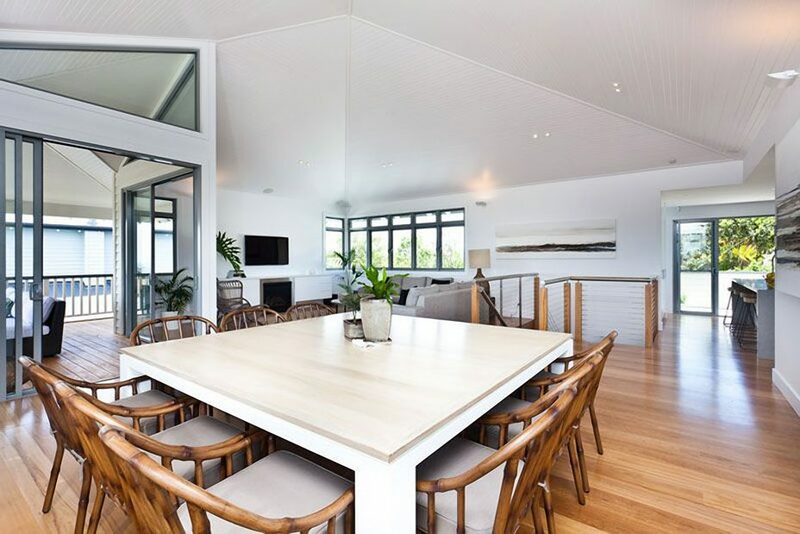 Another luxury living area is located downstairs and opens out through glass stacking doors to the lower deck with additional 12 seater outdoor table and amazing Hinterland-ocean views. Vantage offers the Foxtel Platinum package, with over 80 channels, available on both flat screen TV’s. 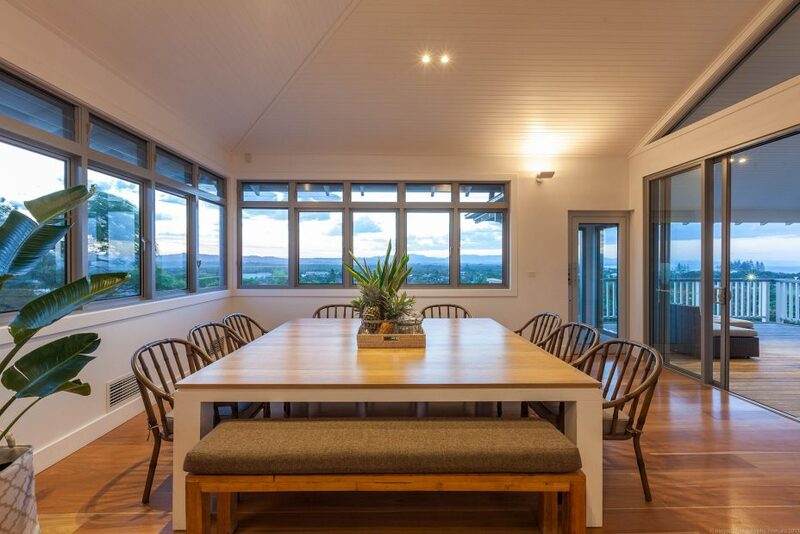 The open plan living, dining and cooking space continues the luxurious simplicity of the home – polished timber floors, loads of natural light and boundless views. The fully functional kitchen allows for gourmet creation, with top of the range European appliances. An automatic coffee machine keeps the caffeine flowing and guest chefs can whip up creations from the organic herb garden out the back. 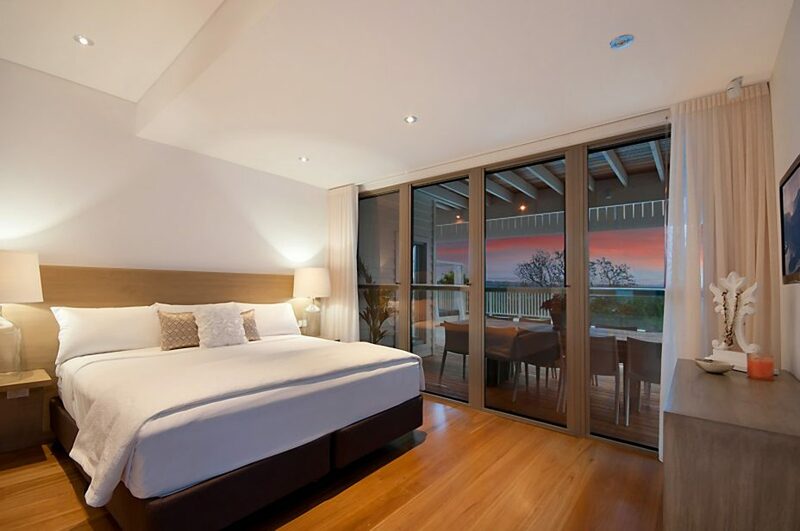 The luxurious master suite comes with an ensuite and opens out to the sundrenched timber balcony overlooking the infinity pool, with views beyond to the Hinterland and Pacific Ocean. All bedrooms are spacious, plushly furnished and light-filled. Vantage boasts 3 bathrooms, with one shared guest bathroom complete with bath and double open shower and 2 ensuite bathrooms. An additional separate toilet is located both upstairs and downstairs. All bathrooms feature luxurious heated Italian stone floors. A huge, impressive covered outdoor entertaining area sits on the upper level, with plush outdoor lounges, soaring ceilings and breathtaking views. A lower deck area that wraps around the lower level features a wet bar, BBQ and an outdoor dining space with seating for 12. Take casual al fresco dining up a notch to absolute luxury with these dual outdoor entertaining areas. The garden includes an organic herb patch and a children’s cubby house. 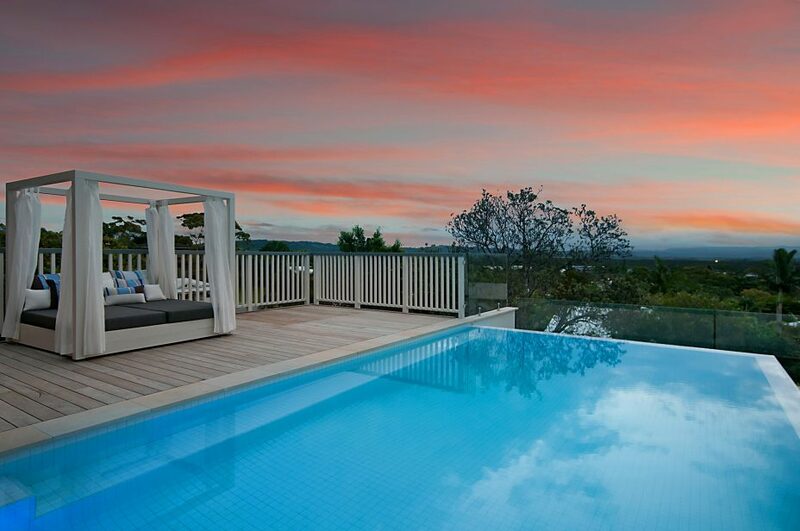 Bathe in the sun-soaked, stunning infinity edge pool, overlooking the ocean below. Nap in the shade overlooking the pool in the sumptuous, resort-style, custom-designed day bed. 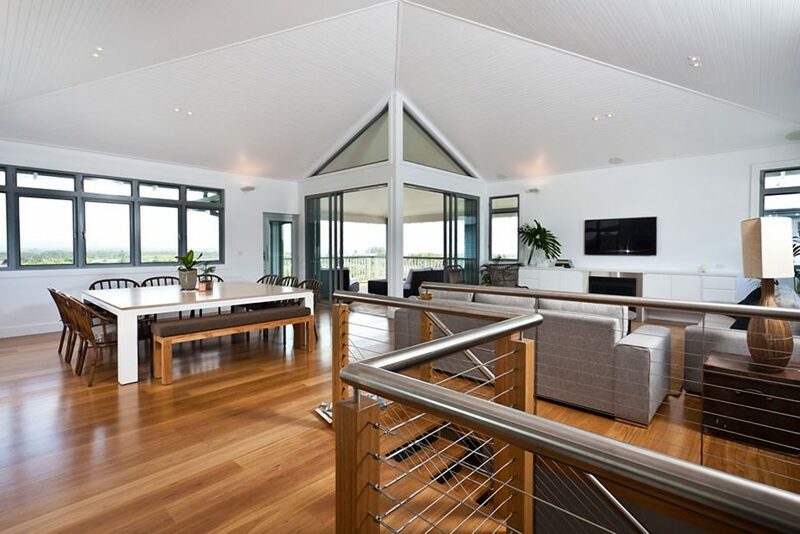 The property includes ducted air conditioning throughout, offering cool in summer and warmth in winter (as well as the gas fireplace located in the living area). 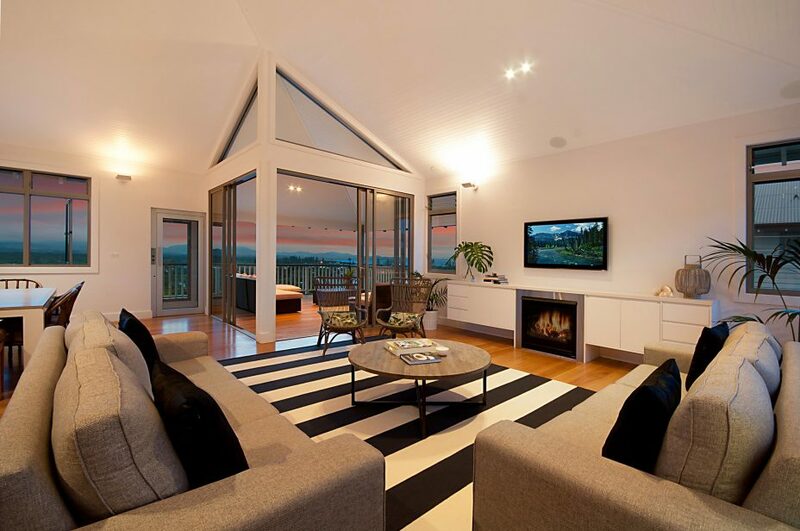 WIFI is available and the Foxtel Platinum package which offers over 80 pay-TV channels. 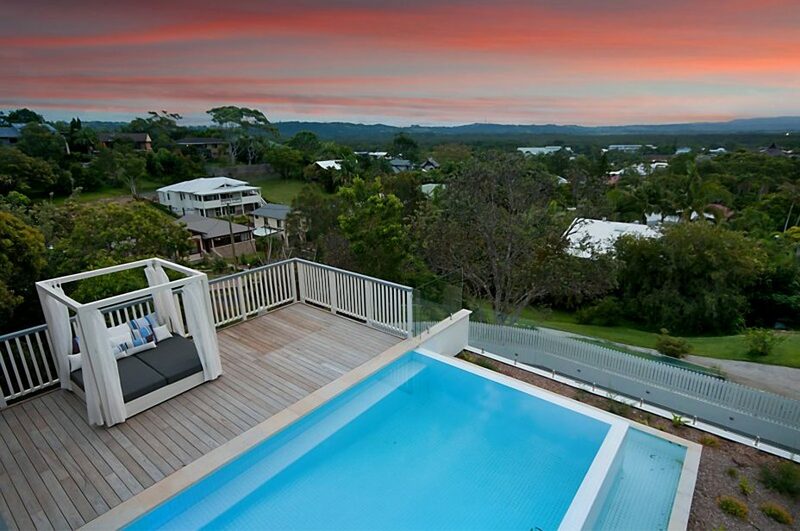 Vantage Over Byron is located on Ruskin Street, one of Byron Bay’s most upmarket areas. It’s handy proximity to the centre of town means that guests can walk to Byron’s retail and dining precinct in under 10 minutes. 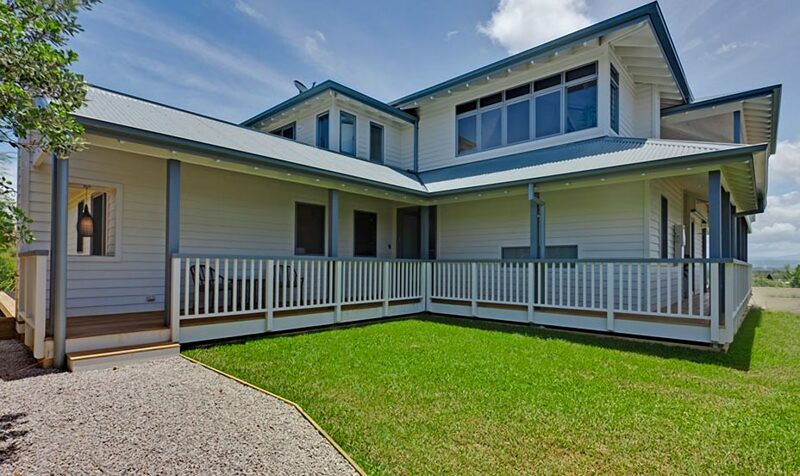 Vantage is only 7 minutes from Byron Bay’s world famous surf, sun and sand and is conveniently 2 minutes stroll from the popular cafe, Top Shop. Also nearby is Tallows Beach, Arakwal National Park and from this central location, guests can gain easy access to surrounding villages and beyond. This absolute luxury property can accommodate 11, with 5 spacious bedrooms and 3 bathrooms so is perfect for extended family groups. Being close to town and beaches, as well as having a pool and children’s playhouse promises hours of fun for kids of all ages. Group restrictions – family groups preferred. Maximum of 8 adults at the property unless otherwise approved.